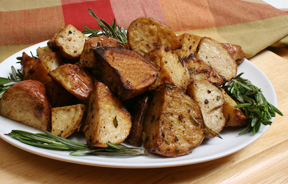 Great no-fuss side dish that everyone will love. The bacon adds that extra flavor to put these potatoes over the top. Serve with ketchup beside a grilled burger. 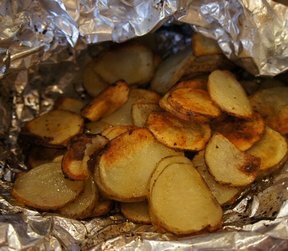 You will need enough heavy-duty foil to make a packet. Spray foil with Pam. 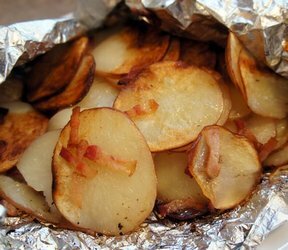 In the middle of the foil, lay potatoes, bacon, onion and red pepper, if desired. Sprinkle with cracked pepper and sea salt. Bring sides of foil up. Roll top and ends of foil tightly to form packet. Heat grill to 400°. Lay packet bacon side down on grill. Cook 45 minutes turning packet over with large spatula every 15 minutes. "My husband has been making potatoes this way while camping for years. He has always used butter and gets lots of compliments. Who knew he had a established recipe?!! All I knew was they are wonderful with no cleanup!!!" 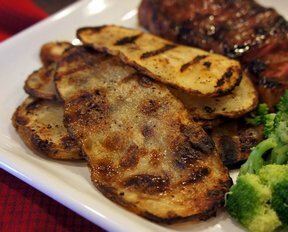 "Surprisingly, I prefer the foil potatoes without the bacon and using butter instead. These were good but just not as delicious as the other ones. Who would have thought that would happen?"